Nasi lemak is a Malay fragrant rice dish cooked in coconut milk and pandan leaf. It is commonly found in Malaysia, where it is considered the national dish; it is also popular in neighbouring areas such as Singapore; Brunei, and Southern Thailand. In Indonesia it can be found in several parts of Sumatra; especially Malay realm of Riau, Riau Islands and Medan. Nasi lemak can also be found in the Bangsamoro region of Mindanao prepared by Filipino Moro. It is considered one of the most famous dishes for a Malay-style breakfast. 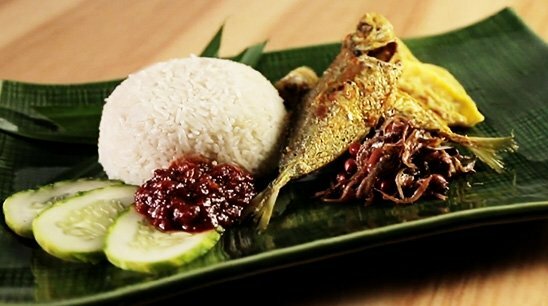 It is not to be confused with nasi dagang, sold in the Malaysian east coast states of Terengganu and Kelantan, although both dishes are often served for breakfast. However, because nasi lemak can be served in a variety of ways, it is often eaten throughout the day.